Grab and Uber have been going head to head for as long as we can recall, with both companies competing against one another to roll out new services for its riders and driver-partners. Last night, Uber announced as part of safety measures, its drivers would have to take a selfie before they can accept rides. 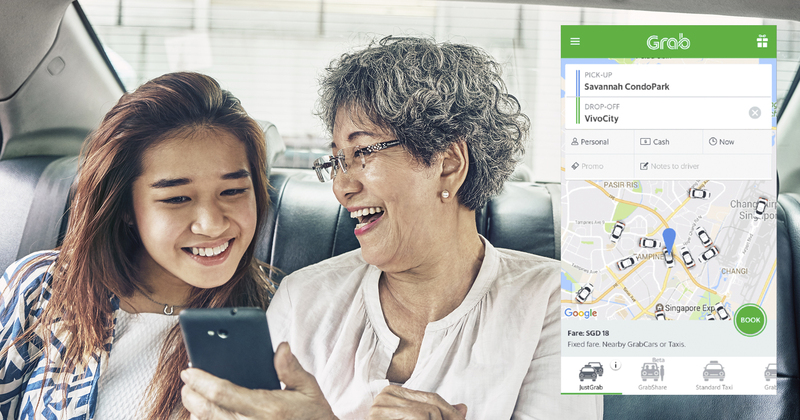 And now, Grab has just raised the stakes again with the launch of a new service. Announced today, JustGrab is the ride-hailing company’s newest service. It combines fixed fare GrabTaxi and GrabCar vehicles to form the largest supply of on-demand vehicles in Singapore. Beta testing starts today, and will be progressively rolled out to Grab’s tiered GrabRewards customers before finally reaching the general public on 29 March. Tip: If you’ve yet to start, perhaps it’s time to check out how your GrabRewards work. 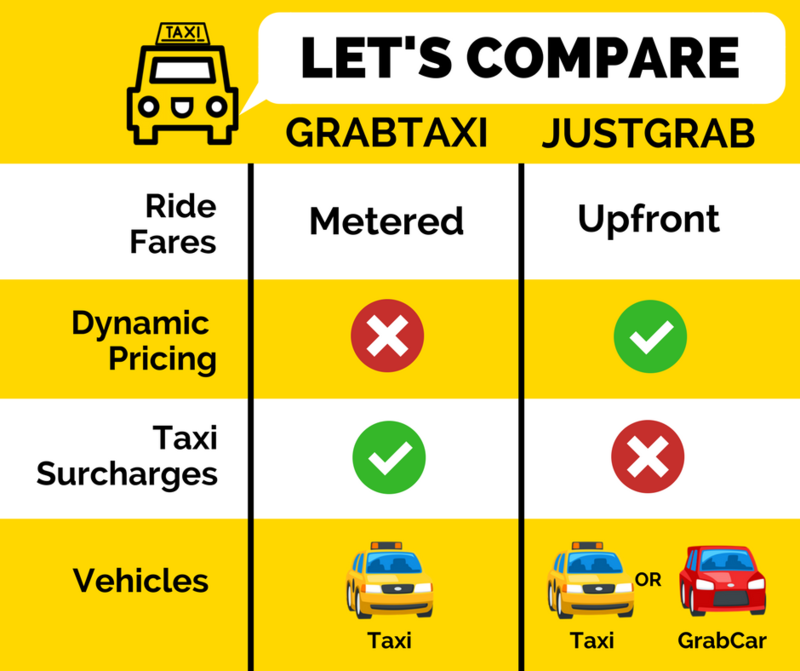 Our friends at TaxiBot, the Facebook chatbot that calls up Grab, Uber and taxi promo codes for you, shared a simple graphic with us comparing JustGrab and GrabTaxi. Passengers only need to tap a button to find the nearest fixed-fare taxi or car nearby. Dynamic pricing (lower costs during off-peak periods) will still be in effect, but with JustGrab, these costs will supposedly fluctuate less. Traditional taxi surcharges such as Midnight Fares and CBD charges will also no longer apply to JustGrab. Aside from toll charges, this means more transparency in ride costs prior to booking. JustGrab is meant as a complement to GrabTaxi and GrabCar, not to replace them. For those who prefer metered fares, Grab’s existing services will still be running. Now this is where things truly get exciting. As Vu shares, the Grab team hopes to “encourage more people to use shared transportation over personal cars, and offer [their] driver-partners additional income opportunities from [their] growing passenger base. Firstly, GrabTaxi driver-partners will get a rebranding of their driver benefits, from the Elite and Rangers programmes to the new Platinum Plus and Platinum programmes. Drivers at Platinum Plus and Platinum tiers will receive quarterly bonuses equivalent to, and at half the previous quarter’s incentive payouts respectively, on top of the incentive they already receive in the current quarter. Driver partners will also receive a 8% Medisave contribution every month, and drivers at Platinum Plus and Platinum tiers will receive 15% and 10% respectively. Drivers at Platinum Plus and Platinum tiers will also be rewarded with special incentives for their hard work. This includes loyalty programmes with subsidised holidays with driver-partners and families, as well as priority queues at Driver Support Centres. Although the programme has only launched its beta testing, the perks already sound attractive. Would it be enough to convert more drivers to join Grab instead of Uber?